Jacob’s Ladder – A traumatized Vietnam war veteran finds out that his post-war life isn’t what he believes it to be when he’s attacked by horned creatures in the subway and his dead son comes to visit him. Drew and JB are at it again, this time with a new intro! We’re reviewing this 1990 classic starring Tim Robbins and boy is it a doozy. So much so that it seems to have affected Drew in a bizarre ladder/freeway kind of way that you’ll learn about near the end of the review. Pretty crazy stuff. So go watch the movie, then join us as we talk about it for a good hour and a half. 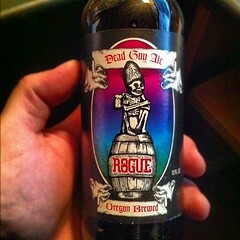 Our beer for the evening was donated by our sponsor, That Bead Girl, and she gave us a 6 pack of Rogue Dead Guy Ale which was not only delicious and 6.5% alcohol, but the name was fitting to be paired with such a flick.